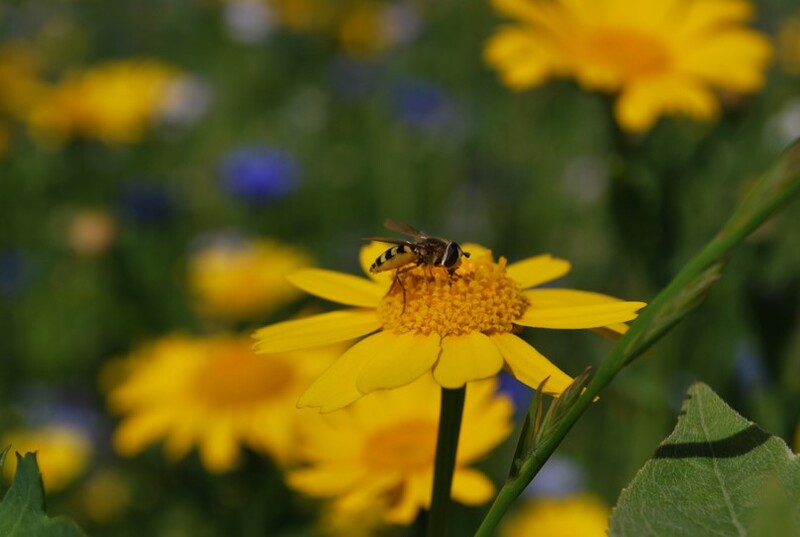 St Davids claims the first citywide accreditation for the Bee Friendly initiative: a scheme that encourages schools, businesses and communities to help combat the decline of insect pollinators by providing them with food and habitat and reducing pesticide use. Acres of new wildflower meadows have been sown, pollinator friendly plants bloom outside businesses and gardens throughout the City and bilingual education boards educate visitors about the variety and importance of British pollinators. St Davids has become a sanctuary for pollinators and a haven for people wanting to learn more about them. 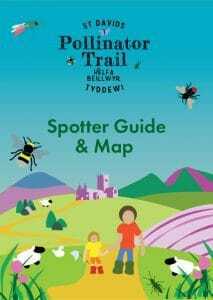 One of the main actions of the new Bee Friendly status is the St Davids Pollinator Trail. The innovative project, pioneered by Dr Beynon’s Bug Farm and supported by Tourism Product Innovation Fund and Biodiversity Solutions, includes two interactive trails linking 18 tourism sites across the St Davids Peninsula. “Each site will showcase a different pollinator alongside their habitat” Sarah Sharpe, project coordinator, explains. “Aimed at families, the educational trail is completely free to do and links simple conservation with art, science and a sense of adventure!” The St Davids Pollinator Trail launched in August 2018. The Tourism Product Innovation Fund has helped support the project behind the Bee Friendly application. Resulting revenue from these projects aims to ensure an ongoing legacy for sustainable tourism in Wales. Small but mighty – St Davids may be the smallest city in the UK, but it stands tall in terms of environmental awareness and conservation. Dr Beynon’s Bug Farm and St Davids City Open Gardens, with support from the St Davids City Council and the Pembrokeshire Coast National Park Authority, have worked with business owners and residents to ensure there is provision for pollinators and reduction of pesticide use across St Davids both in domestic and commercial settings. Plant a pot or a window box with flowering plants. This provides a food source for pollinators. Look out for the ‘Plants for Pollinators’ stamp. Leave a ‘weedy patch’ in your garden. Many British butterflies will only lay their eggs on stinging nettle. The caterpillars then feed on the stinging nettle. Mow your lawn less often! Longer grass provides safe egg laying habitat for butterflies while dandelions and clovers provide crucial food for lots of pollinators. Reduce your use of pesticides and herbicides where possible. Create a home for pollinators with a small bee or ‘bug’ hotel. From left to right: Mike Chant, Mayor of St Davids; Dr Simon Bilsborough, Welsh Government Land, Nature and Forestry Division; Dr Sarah Beynon, Dr Beynon’s Bug Farm; Hannah Blythyn AM, Minister for Environment; Anthony Rogers, Pembrokeshire Nature Partnership; John Mansfield and Julia Horton-Mansfield, St Davids City Open Gardens; Cllr Cris Tomos, Cabinet Minister for Environment and Welsh Language; Steve Sutcliffe, Biodiversity Solutions; James Parkin, Pembrokeshire Coast National Park Authority; Sarah Sharpe, Dr Beynon’s Bug Farm.